Moroso Street/Strip Oil Pans are wet sump pans intended for street-performance machines that occasionally see some track time. Some are modified with either a Deep Sump or Kicked-Out Sump for increased capacity to improve oil control under hard acceleration and to help the engine run cooler. 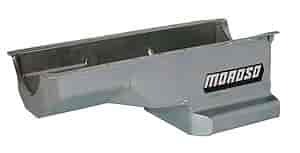 Moroso Street/Strip Oil Pans are designed for simple bolt-on installations in production chassis. Deep Sump Oil Pans offer improved oil control over stock pans because of their increased capacity. Many are specially baffled with a swinging trap door. The one-way baffle keeps oil contained in the pickup area to prevent oil starvation under hard acceleration. Kicked-Out Sump Oil Pans offer increased oil capacity without restricting ground clearance or having the oil too close to the crankshaft. Trap door baffles are also included to provide a constant supply of oil at the pickup under street-performance and racing conditions. Note: All steel pans will have a clear zinc finish. This will fit almost all front steer chassis cars. You would need to test fit the pan to be 100% sure.